Southern California residents are fortunate to be able to spend a lot of time outside. 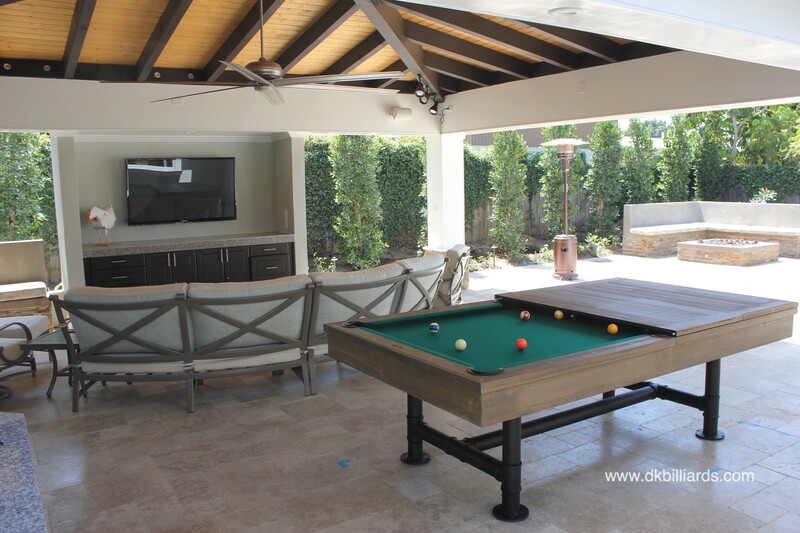 This Costa Mesa family created an outdoor living space complete with dining and billiards. 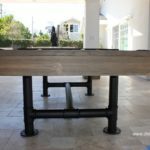 The pipe legs on the Refinery Rustic pool table are a good choice for this covered patio game room. Our customers ordered a custom-fit cover (not pictured) to protect the wood, leather and felt from the elements. The space this family created was multi-purpose and perfect for entertaining. Dine al fresco, shoot pool, watch the game, and relax on the sofas in the ocean breeze. 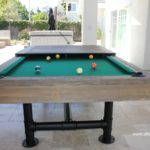 The Refinery has a weathered, scraped oak finish and comes with matching tops. Black leather bucket pockets compliment the black pipe legs and stretcher. 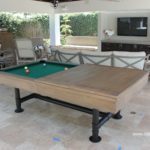 Family and friends will enjoy eight ball competition on high quality cloth and great bounce from the K-66 cushions. 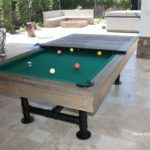 Visit our showroom or call us for more information on the Refinery or our other dining pool table conversions. It’s a bit bigger in diameter than that. Closer to four inches. yes. please refer to our contact page for more information.